Volume 2, Issue Number 2 of 2018 of the Journal of Lexicography and Terminology contains five (5) articles. These are listed below. Volume 2, Issue Number 1 of 2018 of the Journal of Lexicography and Terminology contains six (6) scholarly articles. These are listed below with their respective contributors. The second issue captures yet interesting topics across disciplines. 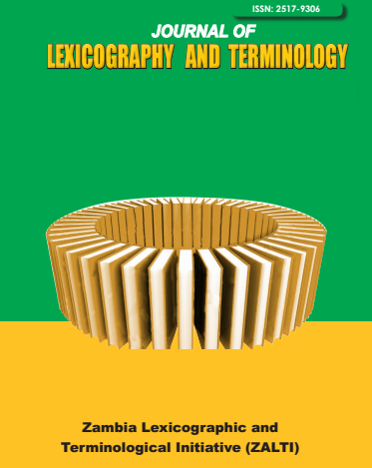 The Journal of Lexicography and Terminology is a multidisciplinary journal published by the University of Zambia in Lusaka, Zambia. It discusses various cross-cultural and cross-disciplinary issues associated with terminology and lexicography in any field of study. The journal is registered with the International Standard Serial Number (ISSN) Agency and its ISSN number is 2517-9306. Lexicography is the study of the lexicon or vocabulary (terms used) in a particular field. Terminology focuses on the terms and concepts and how they are interpreted, related and associated with designated meanings in use in different fields. A designation may comprise symbols, formulae, drawings, pictograms, codes and others. Volume 1 Issue Number 1, was the first issue that was produced in the Journal of Lexicography and Terminology in 2017. The issues covered important topics across disciplines. Furthermore, the Journal of Lexicography and Terminology is a multidisciplinary journal published by the University of Zambia in Lusaka, Zambia. It discusses various cross-cultural and cross-disciplinary issues associated with terminology and lexicography in any field of study. The journal is registered with the International Standard Serial Number (ISSN) Agency and its ISSN number is 2517-9306. Lexicography is the study of the lexicon or vocabulary (terms used) in a particular field. Terminology focuses on the terms and concepts and how they are interpreted, related and associated with designated meanings in use in different fields. A designation may comprise symbols, formulae, drawings, pictograms, codes and others.